As the sound of the bag pipes floated over the lake at Almanor West, the warming sunset with its hughes of melon and magenta put me at peace with life. 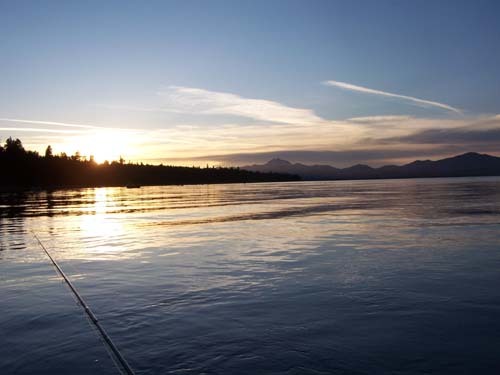 This is the time of the evening for Lake Almanor’s famous Hex Hatch and this particular evening I had hit it just right. It started off slow at around 8:30 pm with just a few hexes hatching sporadically here and there. In the previous 2 years I could not hit this hatch at the right time. I would fish either too early with a nice hatch but it didn’t seem that the fish were as they say “keying in on the hatch yet” or too late with the hatch coming off late in the evening and not many fish biting. This day I had hit it right with out knowing it. As the hexagenia’s started coming up and drying their wings this time I noticed more and more started hatching until the water was sort of boiling. This being the last day of June the fish had keyed in on the hex hatch and with all these mayflies hatching I saw several amazing things happen. The first was the amount and size of mayflies hatching and flying off. The second was the amount of rises and huge huge fish the size of salmon that were jumping out of the water after them. This hex hatch is not for the faint of heart as seeing these huge fish will make your heart skip a beat. The third was the amount of birds and bats also keyed in on this hatch and swooping down for this grand feast. Last but not least is the amazing sunset. Sitting in a float tube, with the quiet dusk slowly engulfing me; I am able to see the outline Mount Lassen and the Northern Sierras. The purples and oranges are spectacular. On this evening I felt a strong tug and off I went being towed around the lake by a huge fish. I didn’t know what kind of fish was on since I’ve seen bass, salmon and trout caught during this hatch but I had a pretty good idea that it was a nice fish. As my 6wt was being bent in half, the nice runs these fish take came back to me. 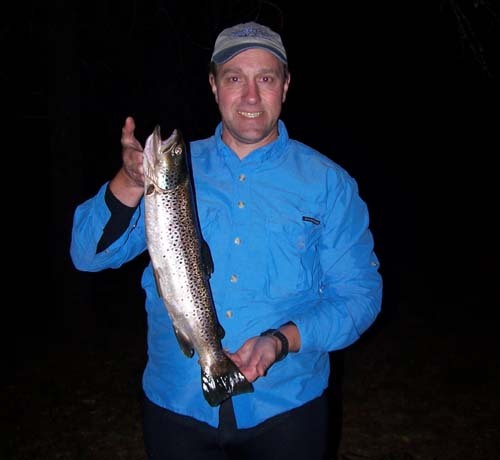 These Almanor fish have big shoulders and take long deep runs. They are not fighting any current and are more than amply fed. This battle continued from about 8:45 until 9 something and by the time it was over my arms, legs and body were spent. My main source of energy now was the adrenaline rush! As I was battling this fish I was looking at my leader at one point. I tie my own leaders and I was happy to see all the knots down to the tippet holding fast. The first glimpse of the fish told me it was a huge German Brown Trout. Some of the thoughts that ran through my head were, “I sure hope my thin looking leader holds and my rod doesn’t break, ok how do I get this monster in my net?” It fought for sometime getting close to my float tube but not close enough to net and then again taking another run, the reel singing that familiar song, zinnnng, zinnnng, zinnnnnnnnng! Finally I was able to land it and as Tom always had told me “you want to keep 1 or 2 of these, the meat is red and they are simply delicious” now the question was how do I fit this giant in my float tube’s side pocket? Well as I had done in the past I managed it very carefully. I did not want to loose this fish! I continued fishing until the end of the hatch and I was pleasantly surprise to find my wife andkids still up at up 10pm roasting marsh mellows by the fire as I drove up to our camp site. We camped as usual close by where Tom had suggested more than 5 years ago at Almanor West. This time it was my daughters turn to hold the lantern while I measure and cleaned my fish. I was surprised to see that it measured in at 22 inches. 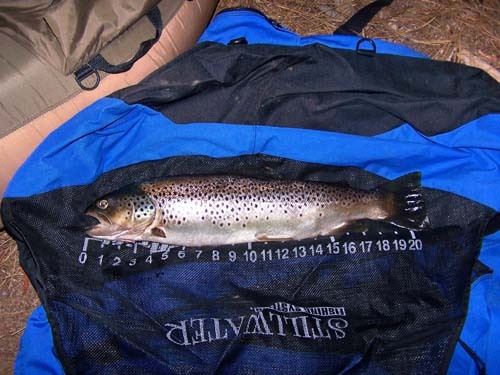 This is the largest German Brown Trout that I have ever caught. When Tom Kilfoil was around he would tell me stories of these 22 inch giants and in past years I came close but this was it. I want to thank Tom were ever he is now, probably in those great big fishing grounds in the sky. I did not get a chance to fish by his side very often but his stories and advice were always great!